This tropical green smoothie recipe post is brought to you by Nature’s Greens who provided a sample for review and a promotional item for my time. I have found over the years that one of the easiest ways to boost my nutrition intake is to blend things together into a smoothie. I throw all sorts of things in them including fruits, veggies, seeds, oils and all sorts of other good things. Green smoothies have become quite popular nowadays as people are trying to find easy ways to get healthier on the go. Green smoothies are perfect for the busy lifestyle because you can just blend, pour into a travel mug of some sort and off you go to run your errands. Sip your nutrients while you shop! 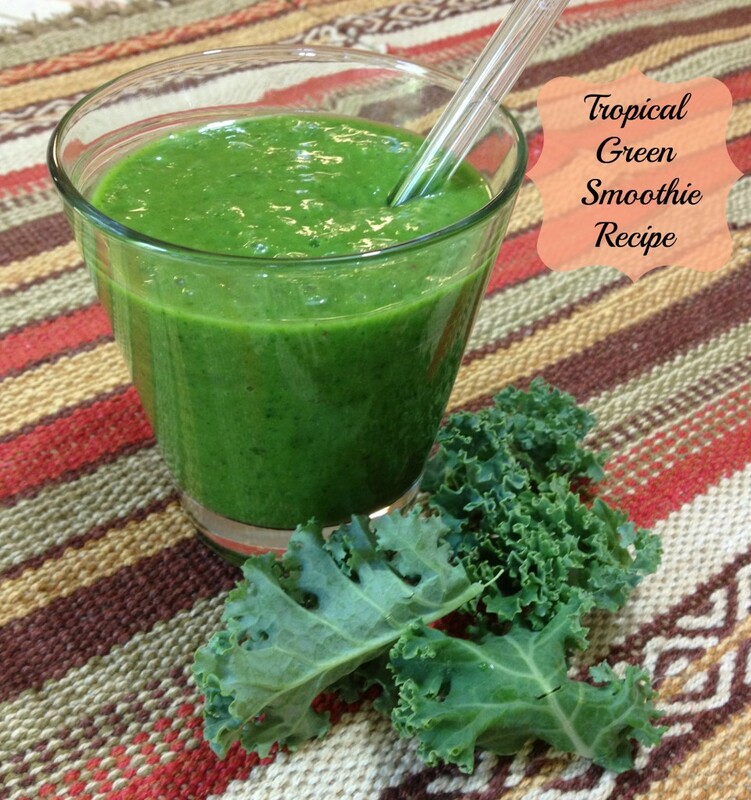 The greens you use in your green smoothie can be anything from kale and spinach to mustard or collard greens. 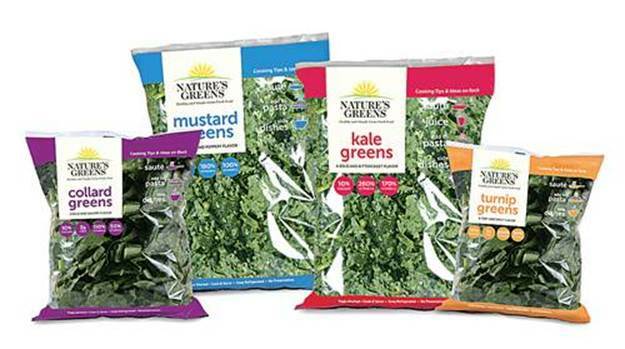 I like to buy the big bags of greens from Nature’s Greens because they come triple washed and ready to use. No washing means less hassle and time spend preparing for my green smoothie! 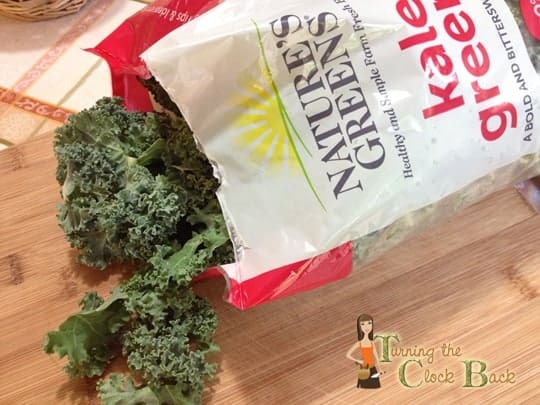 Nature’s Greens offers a complete line of triple-washed, ready-to-use greens such as kale, collard, mustard and turnip greens, along with greens blends. They are available in both one- and two-pound packages and are packaged by WP Rawl, a leading producer of fresh bulk and packaged greens based in Pelion, SC. Nature’s Greens is available year-round and can be found in many large grocery stores like Krogers, Walmart, and Save A Lot. 1. Your liquid base can be anything from plain water, apple juice, coconut or soy milk or any other liquid you think sounds good with your ingredient list. Juices will add sweetness, dairy and dairy alternatives will make it a bit more filling and higher in protein. Water is just fine but you will not have a smoothie that has quite as much flavor. 2. Blend your liquid and fruits first, before adding the greens. This will allow the blades of the blender to move freely and give you the smoothest green smoothie possible. 3. Choose natural sweeteners if needed. If you are adding plenty of fruit and/or juice you may not need a sweetener at all. Taste your green smoothie before adding any sweetener. 4. For a slightly spicier and bolder flavor try adding fresh herbs to your green smoothie. Herbs are easy to grow in your garden or landscaping so you can always go out and grab a handful when you need them. 5. To thicken your smoothie you can freeze your berries before adding them to the blender or add ice. 6. Consider adding healthy fats to your green smoothie like avocado oil, flax seed oil, or raw nuts and seeds. 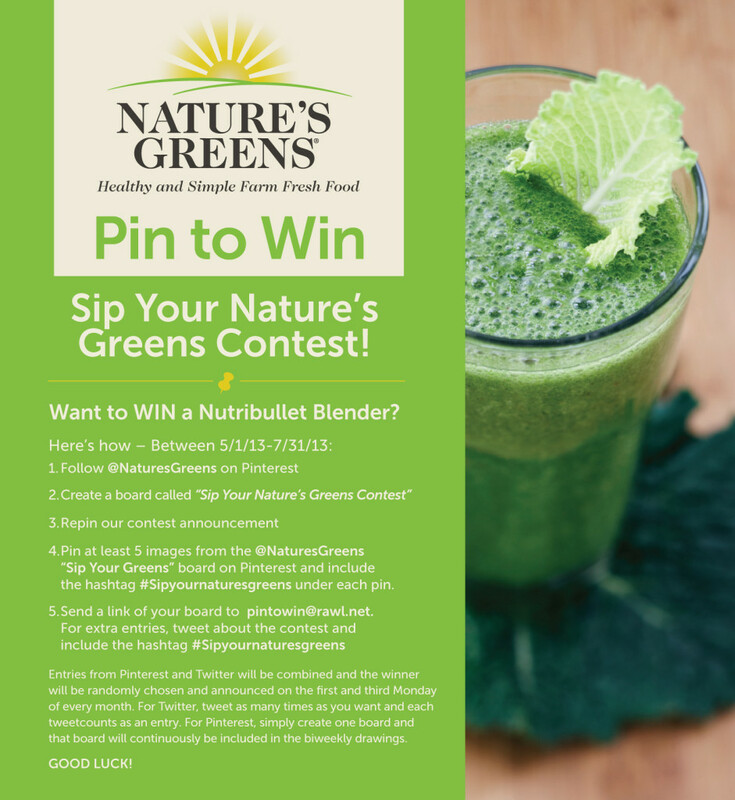 Nature’s Greens is hosting the “Sip Your Nature’s Greens” contest on their Pinterest page from May – July. They willl be picking a winner once every two weeks to receive a NutriBullet blender. Make sure to include the #sipyournaturesgreens hashtag on all your pins! Email your board link to the email address in the contest announcement below. For extra entries, tweet about the contest using the contest hashtag! I don’t have a fancy blender so I just did this in a regular blender and it came out very good. It had a bit more texture than a plain fruit smoothie but the green color was just amazing! I love knowing that this green smoothie is packed full of nutrients. It makes the perfect breakfast or even a filling afternoon snack. In a blender, combine 2 cups of the coconut milk, the pineapple, banana and flax seed oil. When all the kale is added, adjust to desired consistency with remaining coconut milk. Disclaimer: In accordance with the Federal Trade Commission’s 16 CFR, Part 255: “Guides Concerning the Use of Endorsements and Testimonials.”: I received product samples and a promotional item in exchange for my honest review. Some of the links in this post may be “affiliate links.” This means if you click on the link and purchase the item, I will receive an affiliate commission. All opinions expressed here are mine and mine alone. Regardless, I only recommend products or services I use personally and believe will add value to my readers. That really does look good. I've never tried kale in a smoothie before. Oooo! I usually make my green smoothies in the morning with spinach, but I've never thought to use kale. I'll definitely check this out and try it! Thanks!! I love bananas and coconuts so i'll have to give this a try. Thanks! Can you taste the Kale? I'm super picky, but if I could get veggies into a smoothie without tasting them, I'd definitely try it! Juicing them is a great idea! I never would have thought of that! I found that the kale added a touch of flavor but without the bitterness often associated with greens. It was really quite tasty!